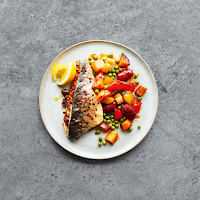 With pre-stuffed sea bass this recipe is so simple and is on the table in under 30 minutes. 1. Heat the oven to 180°C, gas mark 4. Put the fish onto a tray lined with baking parchment and bake for 18 minutes. 2. Meanwhile, put the chorizo into a sauté pan, set it over a medium heat and cook for 4-5 minutes (it will start to release its oil). Stir in the potatoes and peppers to coat, season, then pour in 100ml water. Cover and cook for 15 minutes, shaking the pan regularly until the vegetables are tender. 3. Stir the peas into the potato pan, add a splash more water, cover and return to the heat for 3 minutes until the peas are tender. Season with a squeeze of lemon juice, then serve with the fish and extra lemon wedges on the side.